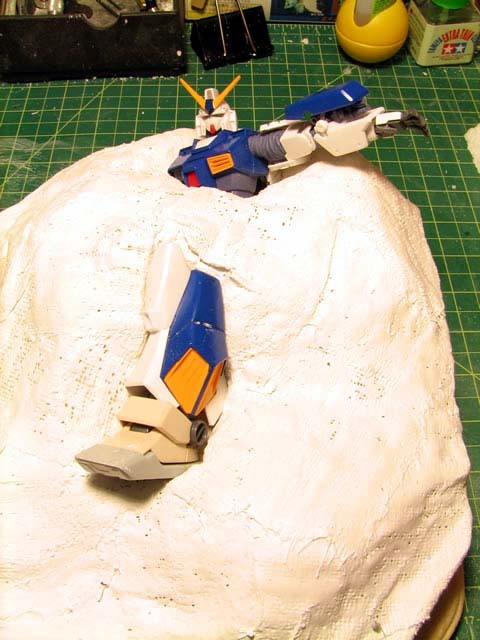 This tutorial shows how to bury a Gundam. 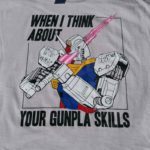 Most of the techniques and materials used in thistutorial are standard materials and techniques used for most dioramas that I build. The very first step is to plan out the diorama. 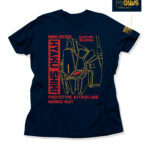 Some folks will draw out a simple sketch of the diorama. 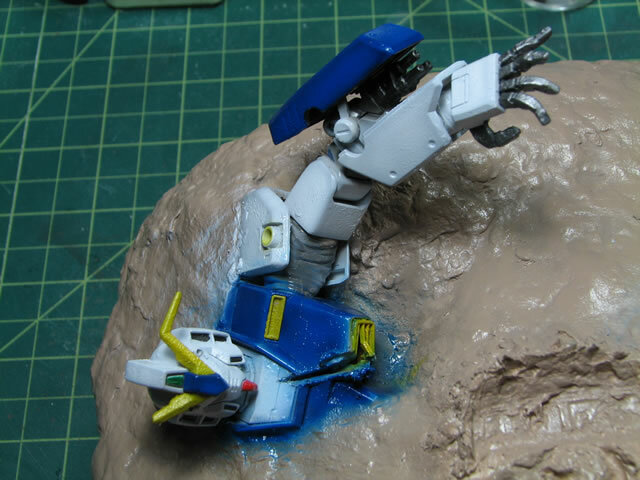 I tend to use the actualmodels as I get a better idea of the final size and positioning of the objects in the diorama. 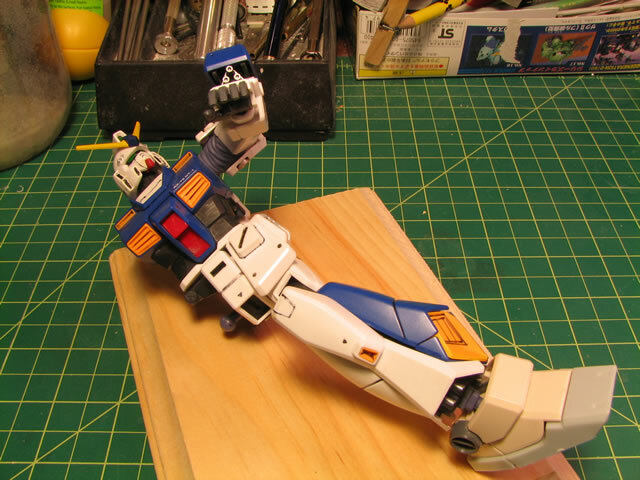 I began thisdiorama with an MG Gundam NT-1; and I plan out the body positioning on a simple wood base. 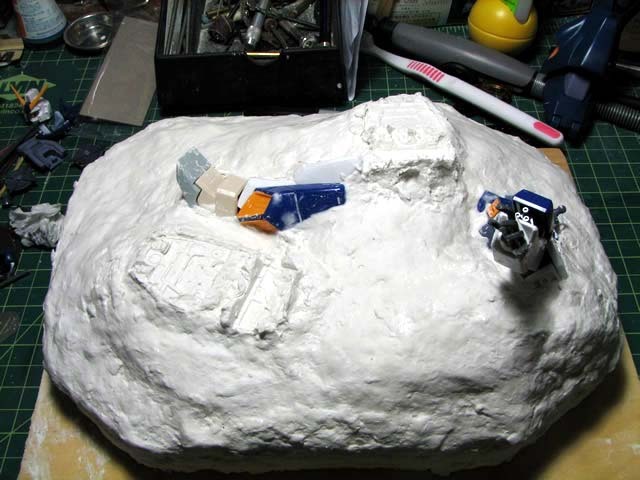 Once I have the general plan, I can start filling in and building the basic structure of the base using styrofoam. 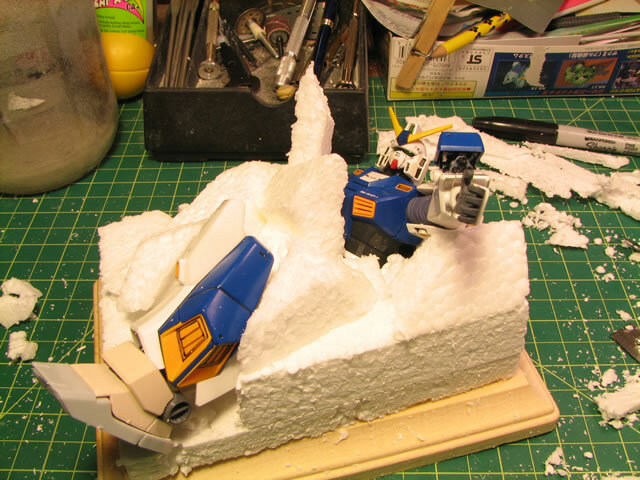 The styrofoam is just cut into small blocks and glued together with epoxy glue. CA glue will not work because it chemically reacts with the styrofoam. Elmer’s white glue also works, but takes a little longer to set up. 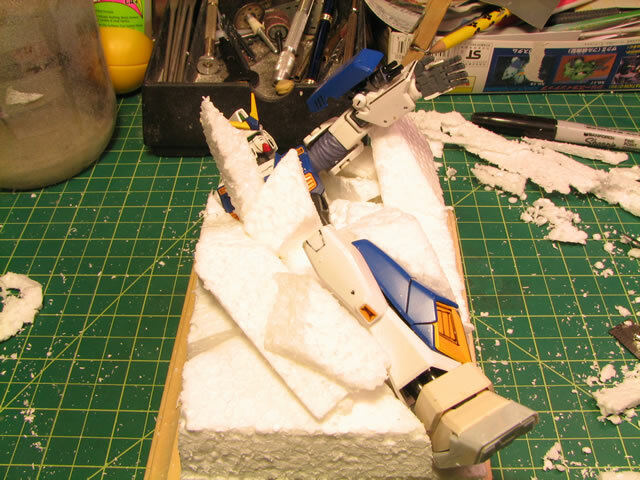 Thebenefit of elmers glue is that it is fairly weak and you can easily reshape your styrofoam base. 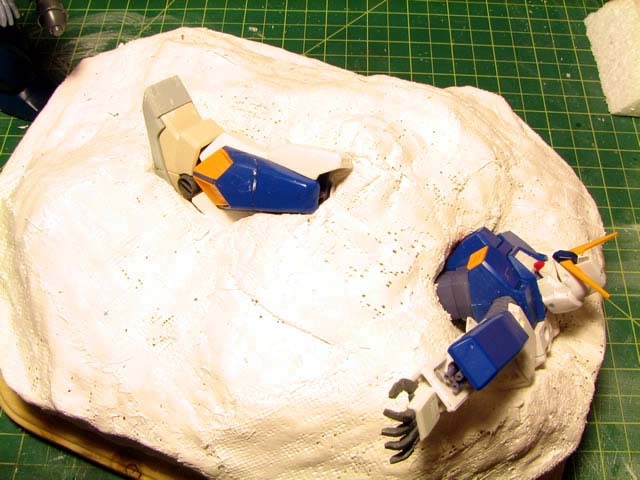 You can usethe styrofoam to create valleys, caves, cliff faces, etc. 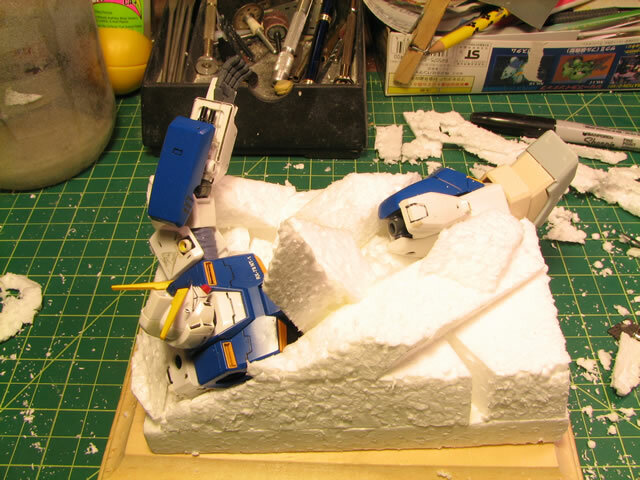 The styrofoam just provides a rough shape and structureupon which the diorama is built. Once the glue has been given time to set up, I apply the first hardening material to the base. I use plaster cloth;which can be found at crafts stores or any hobby shop that sells model railroad scenics. 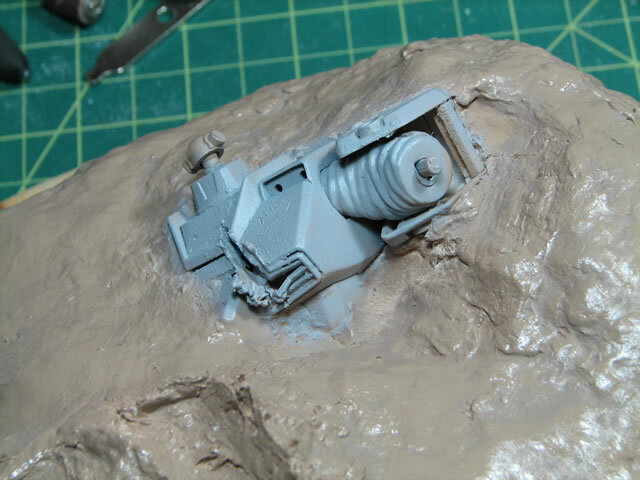 The model is removed fromfrom the base and work to build the base begins. The plaster cloth material is cut into workable strips and then placed in water to activate the plaster. 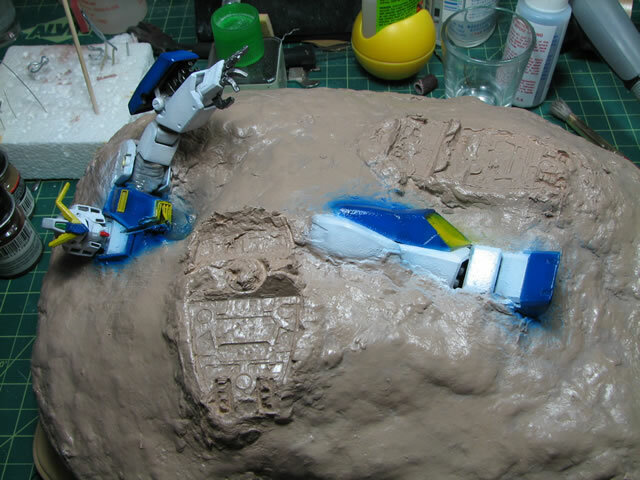 The strips are then placed over the styrofoam base covering all the styrofoam. Wetting your hands and smoothing out the plaster helps create a solid covering of plaster over thestyrofoam. The base is then allowed to sit over night so that the plaster can cure and harden. Once the plaster cloth has completely dried and hardened, I can apply a paper mache or paper clay product. 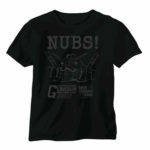 Theseproducts can be found in your local crafts store or model shops. I have used celluclay which is mixed with waterto activate the paper mache. 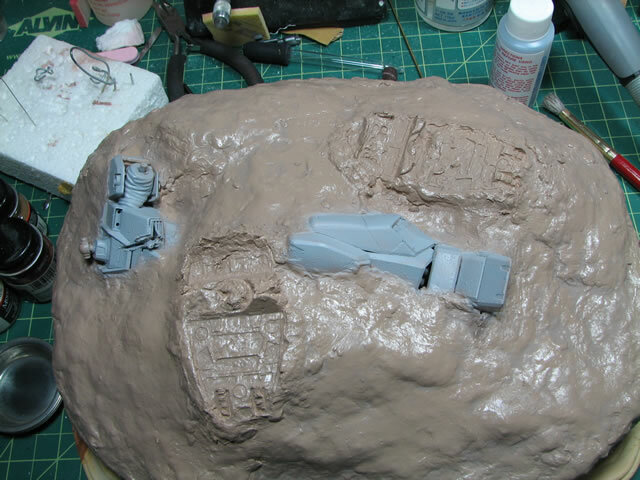 The celluclay must be applied in thin layers as it will tend to shrink as it dries, soto keep the product from warping your base, you must apply thin layers. Paper clay can be molded using various sculpting tools to create an endless array of land scapes. 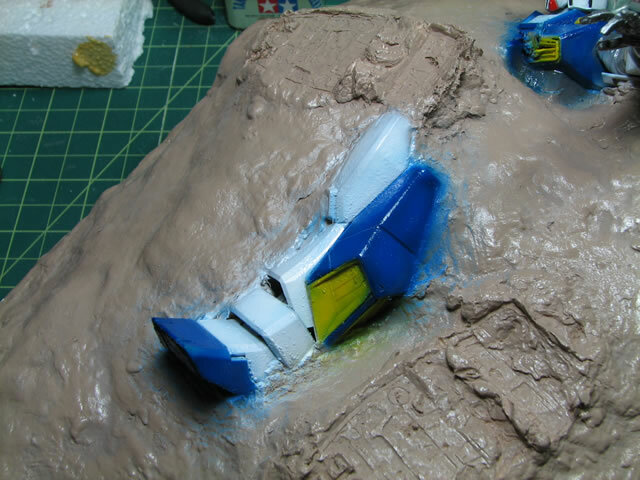 With the paper mache and paper clay products appliedto the base, take various sculpting tools such as spoons, forks, sponges, stiff brushes, and apply textures tocreate rocks, cliffs, cave ports, smooth surfaces, waves, sand dunes, etc. 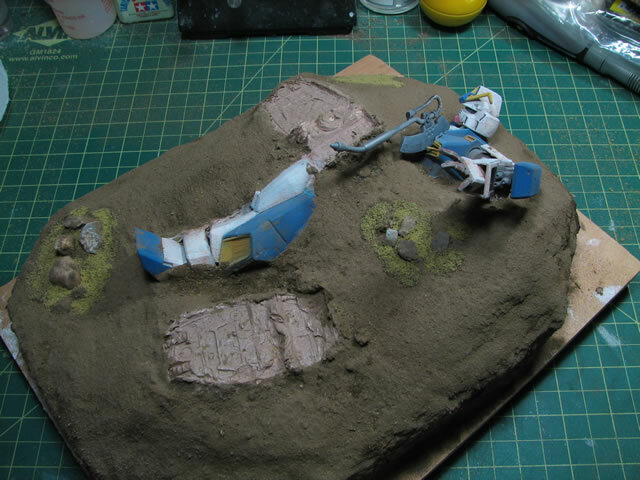 Since I am creating a buried Gundam base, I want some rocks and a desert like scene. 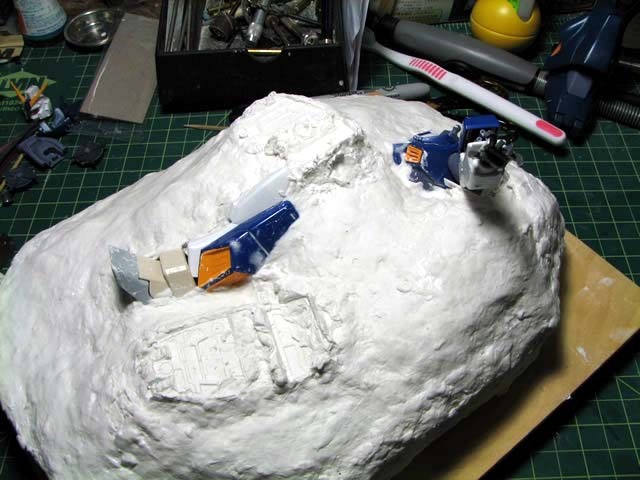 While the paper mache was still moist, I imprinted some foot prints, and sculpted a rough rocky are that suits the theme of the base.For this step, I put the Gundam back into the base and permanently attach the kit to the base with the paper mache. Once the paper mache has cured completely, I can move on to painting. 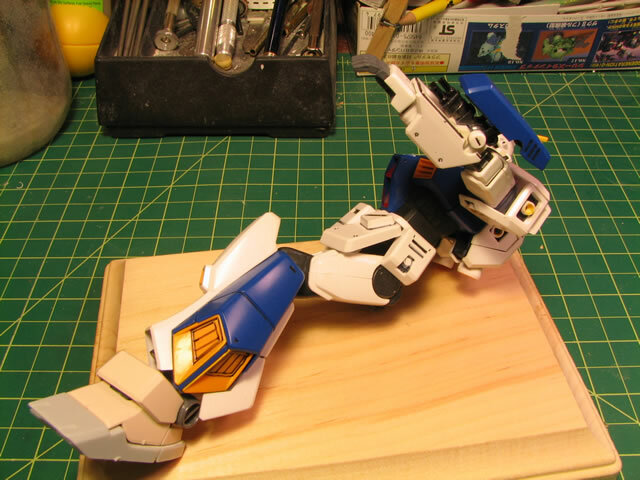 I first spray on a base color for the entirebase, and I used a dark tan. 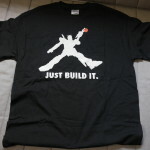 Once the base was base coated, I went and primed the Gundam. 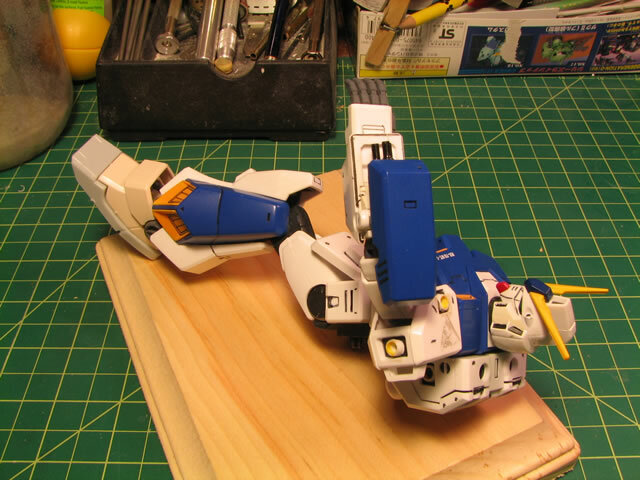 The Gundam is now part ofthe base, so I need to be careful when painting the guy. 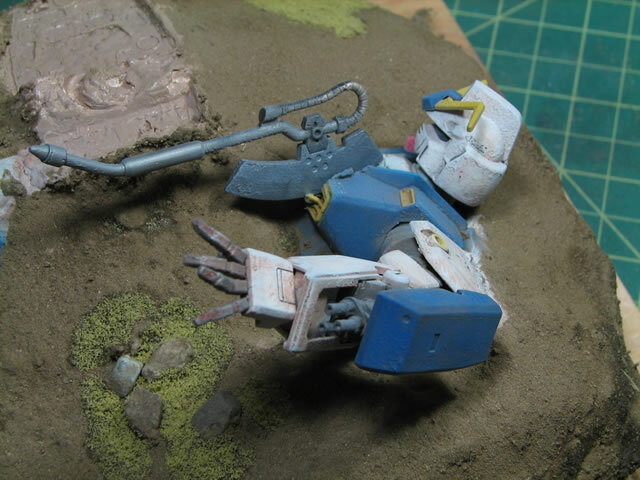 Next the Gundam is painted, weathered, and finished. 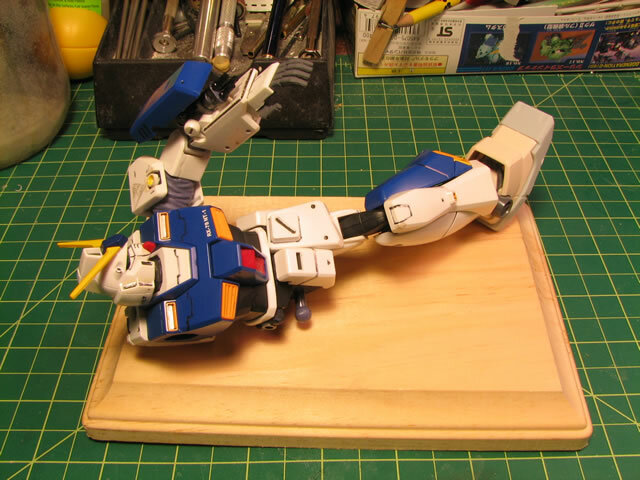 Once the Gundam has been completed and dried, I can move on with applying the ground work to the base. There areseveral means to this step. I used future floor polish as an acrylic medium. It was just brushed onto the base. In the past I have also used white glue thinned with a small amount of water. While the medium is still wet, I sifted dirt I found from my front yard over the base making sure that I covered everything. Adding a few rocks here and there, then adding some yellow grass adds a little color to the base. Once everything is dry, you are done.